I bet you all thought I forgot to post today huh? Don’t give me that innocent look. I know you were. Well… guess what? I didn’t forget. I blame my crock pot. Crock pots by definition are slow cookers. Which means I didn’t figure that into writing about it until 8 hours later. Me smart, no? Ever since I started working again, I get the feeling that my day is actually shorter than 24 hours so trying to cook dinner every night is a struggle. Hubs and I are so tired by the time we get home that it’s just easier to call up delivery (because we’re also too lazy to go pick it up too) than spend an hour cooking and another hour washing dishes when all we really wanna do is park our bums on the couch and stare at our TV like zombies. But this month I promised myself I would forego the fast food and meal plan better by taking some foodie friends’ advice about using my crock pot more often. What better way to wash down the coughing, sniffling, sneezing, runny nose so you can rest medicine than with some soup. Warm french onion soup with ooozy melted cheese. Mmmm… cheese. Peel and thinly slice the onions. Put in the slow cooker and toss with olive oil. Cover and cook on low for 3-4 hours, stirring occasionally. Continue to cook for total of 8-10 hours until the onions are well cooked and caramelized. When the onions are done, add broths and Marsala wine. Cover and cook on high until hot, about 15-30 minutes. Preheat oven to 400F. Put french bread slices on a baking sheet and brush with olive oil. Bake until golden brown, about 10 minutes. Set aside. Ladle soup into individual oven proof bowls and place on a baking sheet. Top each bowl with a slice of toasted bread and cover with a slice of Gruyere. Make sure that oven rack allows bowls to fit comfortably under the broiler. Turn on the broiler and broil until cheese melts, about 1-2 minutes. Serve immediately. 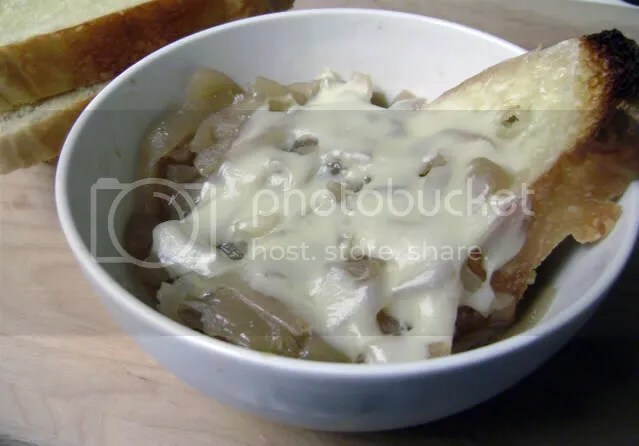 I love french onion soup and this recipe was good but I’ll probably keep looking for my go-to recipe since this one wasn’t exactly perfect yet. If anyone has a recipe they recommend, I am all ears. Entry filed under: crockpot. Tags: french onion soup. That looks delicious! I’ve never had french onion soup but I love onions so I really should give it a shot. You’ve never had french onion soup? Oh its SO good esp if you like onions. Definitely get a bowl of soup on the side next time you go out. No short cuts for this one. You have to slowly caramelize the onions for maximum flavor. Takes at least 45 for that step alone. Are you feeling better? I’ve been dousing myself with Theraflu and Airborne. I slowly caramelized for like 8 hours in my crockpot. Took all freaking day! If there’s a recipe that takes only 45 minutes, I’ll take that over 8 hours. Bummer you’re still sick. I still have all the wonderful symptoms – coughing, sneezing, sore throat. I am sucking down dayquil like jelly beans. Stovetop caramelization, slowly sauteing until onions are browned and softened. Can’t achieve that in a crockpot no matter how long it simmers. Once the onions are golden brown, that’s when you add the beef stock and let the soup simmer. Both my noses are plugged and I’m breathing through my mouth. Oh, and the coughing, sneezing too. Your soup looks delicious! And you can’t go wrong with bread and melted cheese! Yum! Melted cheese anything is a plus. Ooh..fondue. Oh snap. You just said the magic word. Fondue. I NEED to get a fondue pot. Oh snap. You just said the magic word. Fondue. I NEED to get a fondue pot. Stat. Your soup looks warm and gooey. Perfect for the chilly weather. I am not a huge soup fan but I love soup in the winter (or when I am sick). Must be the weather affect. Nice to meet you! Thanks for Alton Brown soup rec. I’ll have to give that one a try! I really like French Onion soup… but the fact you went the extra mile and expense to toss with some fabulous cheese.. YUM.